First, before I say anything else, I have the best barn in the world. Almost five years ago, when I was looking for a barn, my biggest factor was quality of care and specifically attention to the detail of that care. I have been blown away over and over and over again by how incredibly good everyone at the barn is and have been amazed again these past few weeks. I cannot possibly thank them enough, though I intend to keep showing up with bottles of wine and baked goods for some weeks to come. 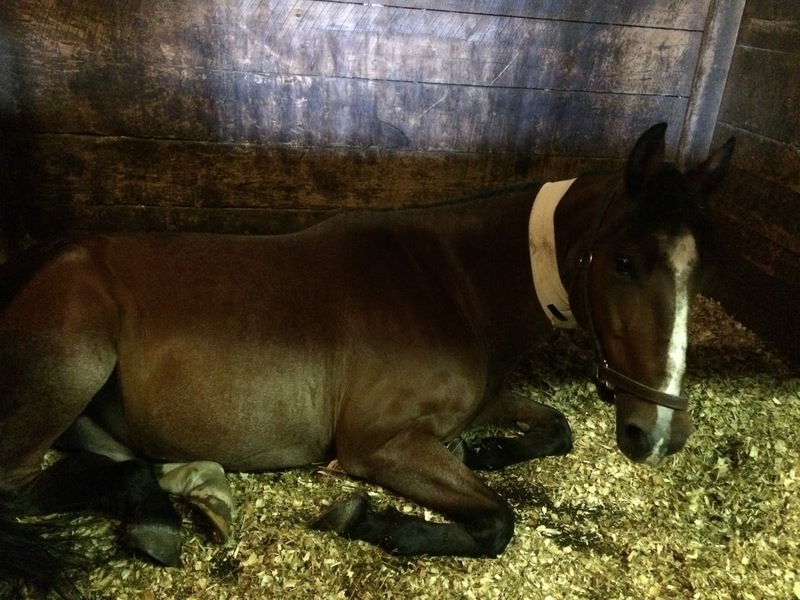 Before I start to tell Tristan’s part of the story, please know at the outset that he was the third horse in the barn to come down with this mystery disease, and – KNOCK ALL THE WOOD – is so far the last. We don’t yet know what it is/was, or even its vector, since the horses had zero contact with each other and obsessive quarantine measures were begun with the first horse and maintained right on through. So: we start the story last Sunday, when I came out to do a short road hack with Tristan before I headed out to a work even in the southern part of the state. 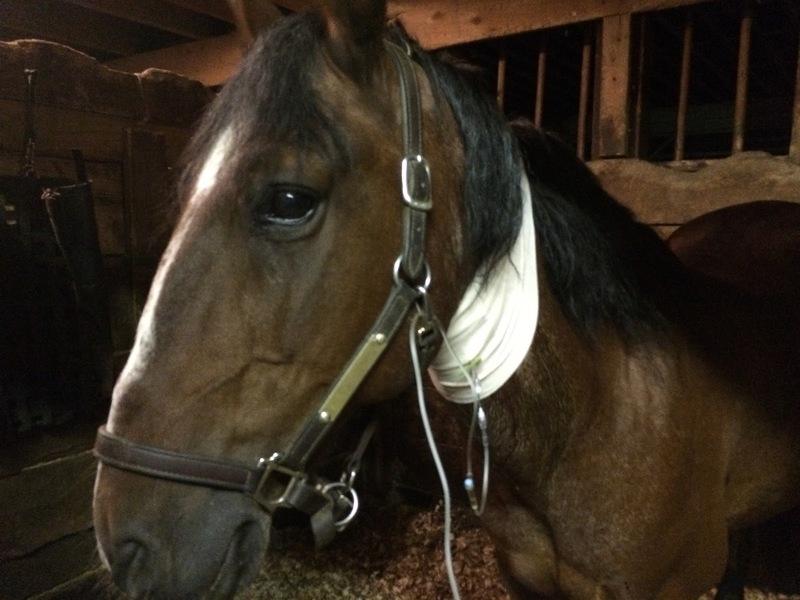 By that point, he had been getting twice daily temperature checks for three days, along with every horse in the barn. That morning, his temp was fine. That afternoon, about 3pm, I held him in the aisle before heading out so the barn worker could do his temp and I watched her face fall as the thermometer kept rising. I swallowed bile and tried to fight back my fear; he’s never run a temperature, to my knowledge, in the decade plus that I’ve owned him. The vet’s protocols called for a dose of banamine at 101.5; the barn worker and I decided that he was close enough, and gave him a dose. I put him back in his stall and started running through “but what if it’s nothing?” scenarios in my head. I put the barn manager and vet on alert, and went to do my work event. On the drive back, I checked in with the barn worker, who we’ll name as L. for continuing blog purposes – she and I spent a lot of quality time together in the next week. She reported that his fever was up above 102: clearly rising. I called the vet (and my husband, and a lot of other people), and sped back up from southern Vermont. We all met at the barn at 9:00 pm and Tristan was pretty clearly not himself. His fever was holding just above 102 but he was listless and unhappy. 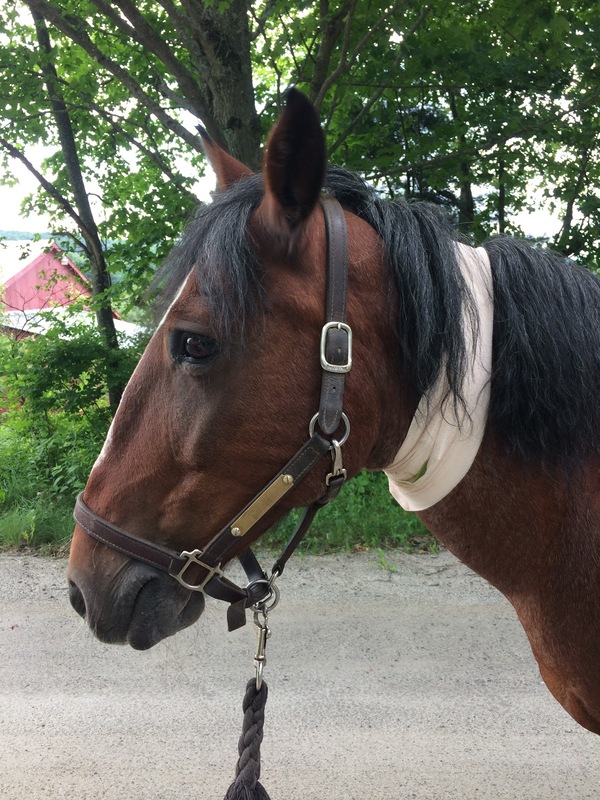 We moved onto the next phase of planned treatment, following the pattern of what had worked with the other horses. We basically spent the next two days in a blurred cycle of that same treatment. The vet did a catheter for an IV drip, and that night he got a dose of tetracycline in 5L of fluids along with another dose of banamine. Before the vet had reached us, L, had already done his first alcohol & cold water bath to try to keep him cooler; we did a lot of those over the next few days. The vet left us with several more bags of fluids, two more doses of tetracycline, a bottle of banamine, and several tubes of Gastroguard. She also pulled blood for a CBC panel and noted that his gut was hypermotile (ie really gassy) and seemed uncomfortable, though he had passed some relatively normal-looking manure. I got home around 11:30 pm, got a fractured 90 minutes of sleep, and headed out for the 3am check, during which I took his temperature – still above 102 – and iced his front and back feet. I got home at about 3:30, and then at 3:45 my dog jumped on the bed crying pitifully and scratching so hard she was shaking the whole bed. When I reached down to pet her and comfort her, I discovered that nearly every inch of her body was covered in hives. She’d shown no signs of that the day before, and this was the first time she had ever done anything like that. She was also miserable, so I got up, gave her a long, cold bath with the oatmeal shampoo I had on hand, and wrapped her in a towel to snuggle and dry. None of that helped; she continued to cry and started shivering violently, even when wrapped in the towel. So off to the emergency vet we went, where she got a dose of benadryl and dex. She would spend the next seven days on benadryl as we tried to chase the allergic reaction; I won’t write about that more but it’s in the background of all of this and as I write that allergic reaction has given way (or transformed into? unclear!) a nasty staph infection that has blossomed into an infected lesion on her nose. So I am on round 2 of vet bills this week. 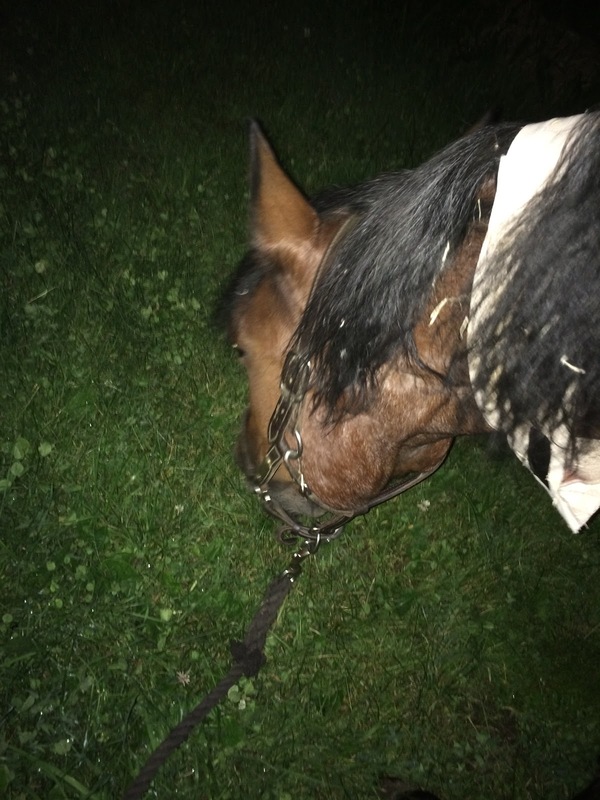 Anyway: on my way back home, I got word that at morning check Tristan’s temp was down below 102 and he was a tiny bit perkier after his morning banamine, so I got another 90 minutes or so of sleep, then headed back into the barn. That morning temp check was the best point of his Monday, because he started a cycle that went for the next 36 hours of ramping his temperature up until the next banamine dose, while we tried to help bring it down in other ways. 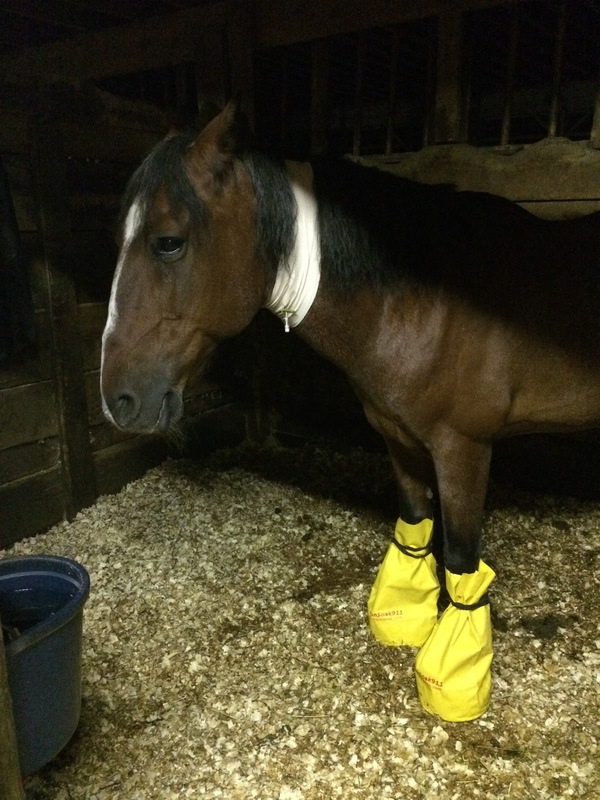 About every hour or 90 minutes he got another cold alcohol bath and I iced his feet, front and back, both to help with temperature and as a preventive measure against laminitis. In his better moments, I took him out for short walks after his baths, because the road was shady and there was a little breeze and he seemed happier when he was moving. At his worst, he went up to 104.3 right before his afternoon banamine dose, which is pretty darned high. The other horses who got this had gone as high as 105, so we had our fingers very crossed that was the worst of it – and thankfully, it was. He was so, so tired through the whole thing but he was wobbly enough that it was hard for him to lie down, so it was actually progress that he laid down for a short nap. He still wasn’t eating or drinking on Monday, so he got another 5L of fluids. Even though he showed no outward signs of dehydration – his skin was popping back just fine, his capillary refill was good, his gums were a healthy pink – he clearly started to perk up and feel better about halfway through his bag. He got another dose of tetracycline that night, and I chatted with the vet after; she was concerned about his total lack of interest in food, which was VERY un-Tristan-like. So we tried to take him out for handgrazing, 20m at a time; he was interested, but not enthusiastic. He spent chunks of time staring into the middle distance and biting at bugs rather than attacking grass – again, very not like him. I did the 3am check again, and temp check went fine. I also took him out for more handgrazing and he started to seem a little bit more like himself. I brought him back in, iced his feet, fussed over him, and then did my first solo flush of his IV line. I’d been instructed how by the barn manager and had done it supervised by L. in the afternoon. It’s a simple enough procedure, the kind of thing pretty much anyone could do. Well, at that point I’d had maybe 5 hours of sleep in the past 48 hours, and the wheels came totally off the wagon. I am not sure if I didn’t tap the syringe of fluids out enough or what, but I saw two small bubbles go into the IV line from the syringe. I finished the flush, closed the line, my hands shaking and totally numb, and had a complete and total panic attack. Everything caught up to me at once. I called the barn manager who assured me that two tiny bubbles were not going to cause a problem. I called my mother, who is a nurse, who asked flatly “did he drop?” She said if I had actually gotten enough air to be problematic in the line, he would have dropped fast and hard, and by the time I called her it had been 20 minutes since I’d done it. After another 20 minutes I convinced myself he was going to be ok. I got halfway home and became convinced I hadn’t closed off the line properly. Cue another panicked call to my mother. I turned around while talking to her and she assured me that there was a plastic stop on the line, so even if I hadn’t closed it off in the correct order (before taking the needle out) air could not have gotten in the line. I went back to the barn anyway and took a picture of the line closed up. I went home again, and laid awake trying to work my way through the aftershocks of the panic attack. I probably got another hour or two of sleep, baked a gluten free cake for the barn manager, and headed back to the barn, where his temperature had finally, finally started coming down and staying down. 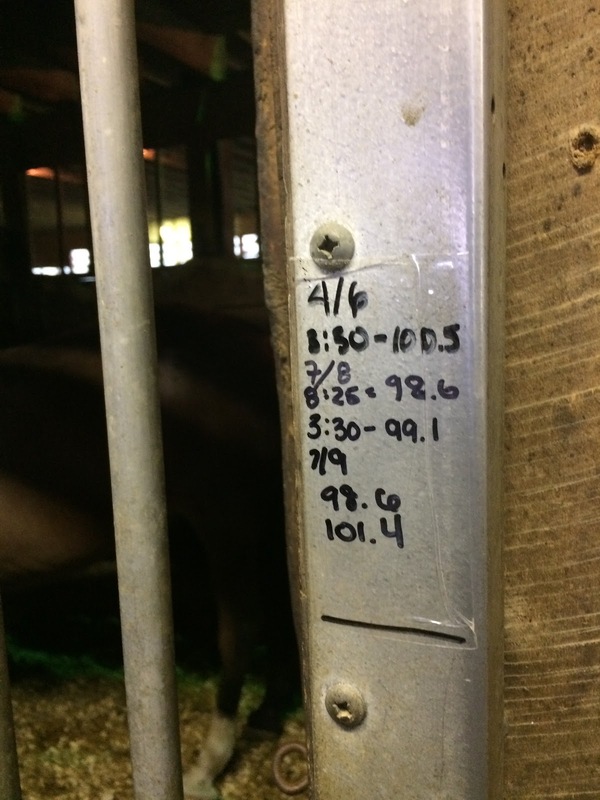 I did some more handgrazing with him, and he got more fluids in the afternoon, but by early afternoon his temperature had held normal so consistently we held off on his banamine dose. He got one last dose of tetracycline that evening, and I was relieved from the 3am check for everyone’s sanity. Wednesday, I spent a good chunk of the day washing and disinfecting everything: all his brushes, all his tack, all his blankets, all his saddle pads. I also washed all of our own bedding and the dog’s bedding in an attempt to eliminate an environmental trigger for her hives. I did 12 loads of laundry in about 36 hours. The bar was still under full biosecurity measures, which meant that after every one of his alcohol baths I had scrubbed down the wash stall and then sprayed it with bleach. Every time people went in and out of his stall, they stepped in bleach; ditto the barn itself. 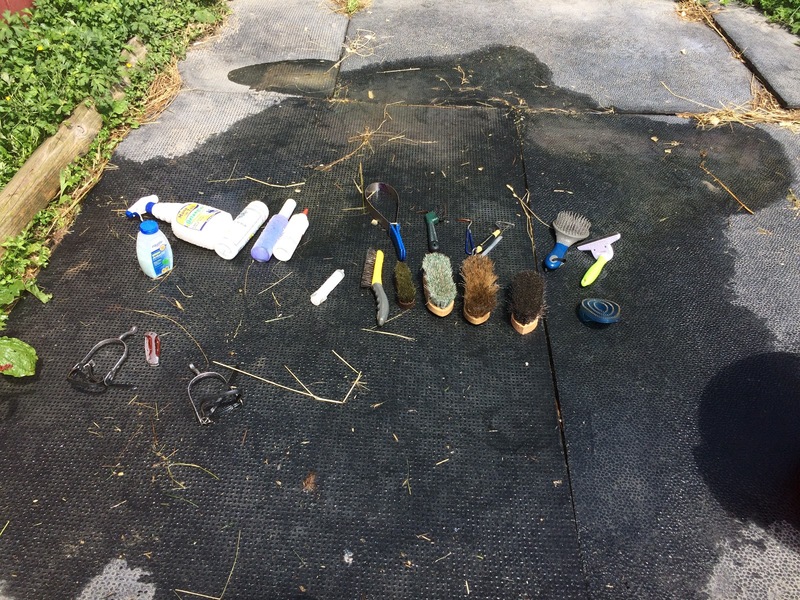 The farrier kept all his tools in bleach and the aisle was scrubbed down after every horse. The barn staff also scrubbed everything they could find – every bucket, every flat surface, every blanket, everything. There were antibacterial hand washes hanging everywhere and every time I touched Tristan I scrubbed my hands, as did everyone else. I didn’t touch any other horses or even go near stalls, and I washed the clothes I wore during the day every single night. 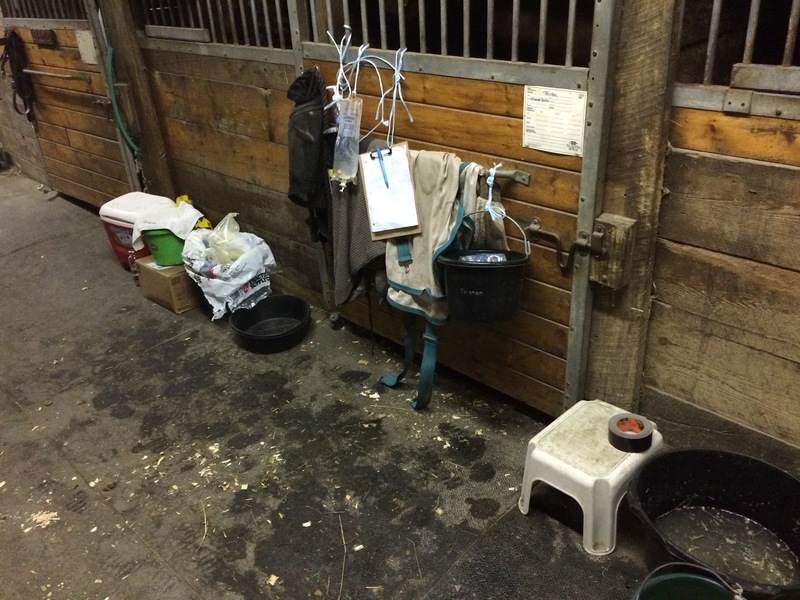 Sick pony station: cooler for ice, box of fluids, grain, trash bag with sharps container, flush fluids hanging on door, clipboard with hourly notes, bucket with miscellaneous things, stool for sitting on during fluids, bucket of bleach, bucket with sponge for alcohol baths. Thursday morning his temperature was holding down still, and he was interested in and excited by food again, not just grass – he was absolutely attacking grass, but he started to work on his hay in earnest, and that night he was happy for his grain again. Eating and drinking meant that he also started to pass more manure. 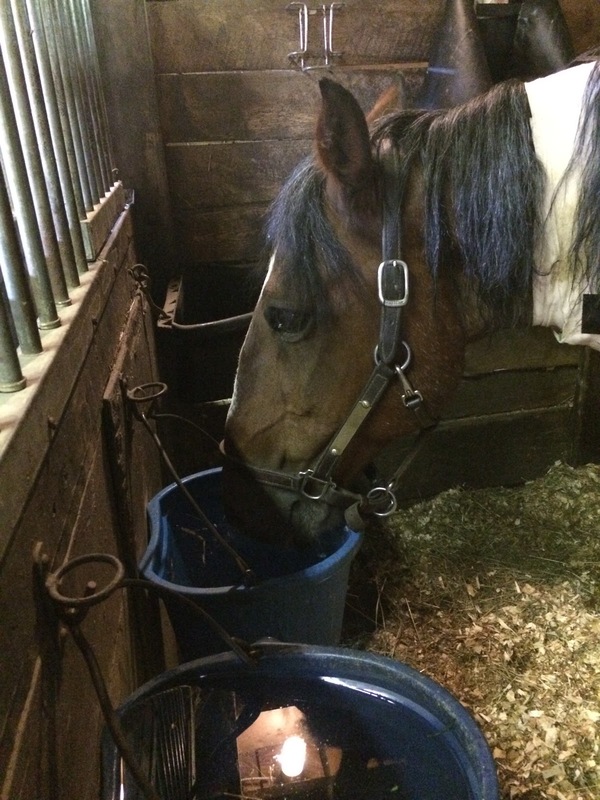 He’d never stopped, but so many of the symptoms of whatever this was also mimicked colic that it was really worrying to see how little manure he was producing, even though there was a logical reason for it: he just wasn’t eating enough. He also got his IV line out on Thursday afternoon, and on Friday morning he got more blood pulled. 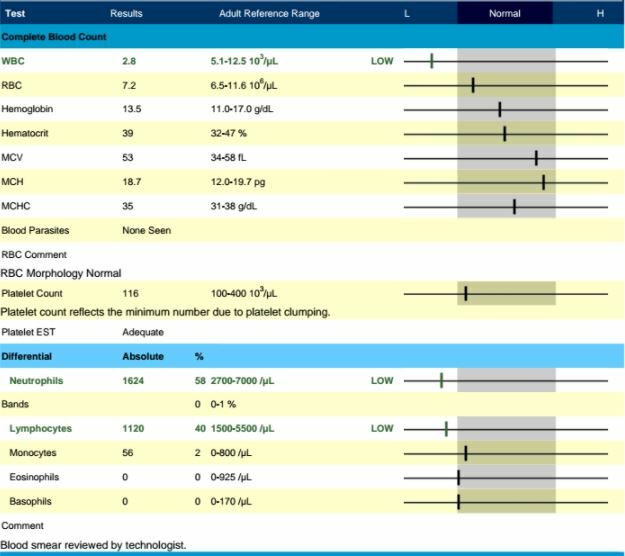 The only thing the first bloodwork showed was that his white blood cell count was in the basement – not entirely surprising, given the vet suspected something viral. This Tuesday, 8 days after he came down with his first temperature, he started going back outside again, in a small isolated paddock, and he’s continued happily and well since then. I don’t know when I’ll put him back under saddle; maybe this weekend. Unfortunately, the dog is now worse, so I’ve refocused my attention and worry on her now that Tristan is stable and happy. He has visibly lost weight, and is still very tired; it clearly took a toll on him, so I’m just as happy to give him more time to recover before I sit on him again. Probably he’ll get a week of light, easy work, too. So there you have it: a very long, very miserable, and still somewhat unexplained week that was made better by the best barn staff and the best vet in the whole world. Ugh, that week really put you both through the ringer. Hopefully the dog gets better soon too and all of you can rest easy and recuperate. i'm so sorry, that's terrifying. we had a flu outbreak at our barn two years ago that at first had us worried about strangles. we were quarantined and had 9 horses in the 'sick bay' with all the rest relegated to the fields with no contact with the barn. and every single horse on the property got their temps taken twice daily. it was intense, so much work, and so scary to see the horses so sick. hopefully Tris makes a full recovery quickly tho! Oh my gosh, what a nightmare! I totally know what you mean about panicking and turning around when worrying about the IV stuff. I feel the same after I give shots, especially when I was giving penicillin. Hugs to all of you, glad Tristan is getting better and fingers crossed for the dog! What a hellish experience 😔 but yay for good barn staff and for helping him pull through! Thinking about your poor pup now, hopefully that wraps up with a good ending asap! Poor Tris and poor you! I'm so sorry you had to go through this, but I am glad to hear he's feeling better. Fingers crossed your pup comes through okay! Gosh, I am so glad he is recovering! So so so scary! I wonder what the heck it could've been?! Hoping your dog will recover soon too! Sorry you're having such a crappy week with all the animal problems, but I'm really glad he's doing better! Such a scary thing when they're sick and you can't get them right. How scary!! I'm so glad he's feeling better! Wonder if your pup came into contact with some of that bleach being used at the barn. That can cause some nasty burns and hives and skin issues. Though, my black dog used to get nasty staph infections every summer. Those were never fun, though typically easily cleared up once we figured out what they were. 😦 Hope she's feeling better soon! That's an interesting thought; it would have had to be secondary contact from me, almost immediately, though? She never goes to the barn – not enough brain. Oof how miserable for everyone. I think it's just literally the worst feeling when our animals are clearly miserable. I hope your dog feels better real soon, that Tristan and all the others in your barn stay well, and that you can catch up on sleep soon! Sounds like your barn has done a great job with the biosecurity – it's a tough tough thing to pull off – big kudos to you all. Thinking of you! I'm really glad to hear that T is feeling more like his old self. Hope that the pupper gets to feeling better too. I'm so glad he's feeling better. Hopefully you're in for nothing but smooth sailing from now on! So scary. I'm glad he's recovering. This is terrifying. I'm so happy to hear he is okay and that's amazing about your barn staff. Hugs to Arya! That's just crazy! So glad he's feeling better. Oh my gosh how horrifying and exhausting! But GREAT JOB to you and your barn staff for acting so well and so quickly with the quarantine procedures. You guys really did everything you could. I'm so glad Tristan is on the mend. Sounds very similar to Potomoac, how stressful for you all. Sounds like good bio security at your barn though. Singles for a speedy recovery.